JoyD: How many pairs of ballet flats do you need? Brian Davis: One more pair than I have now . . . In celebration of another year gone and in appreciation to the commenters on this blog, I am dedicating this post to the topic which has instigated the greatest number of comments in 2013. The "ballerina flats" posts on this blog, for the most part, have featured men wearing flats and for that I thank Brian Davis, who has become my official advisor on the topic. The comments in response to these posts have been inspiring, some anonymously written and some with names, and so from those posts and comments, I have compiled 13 favourite ballet flats in 2013. 2) Maria Sharapova by Cole Haan 'Air Bacara' Flat - "super comfortable and unisex, unfortunately out of my budget" (Ivan, May 12, 2013). These come in at around $200.00 retail full price. PinkPanther222 also likes Maria Sharapova - "I absolutely love my Maria Sharapova Air Bacaras. They cushion the heel with Nike technology, the design helps out a guy with high arches, and they just make me look good. They are elegant, simple and sophisticated. I wear them with jeans and shorts. They are incredibly comfortable and versatile." (May 6, 2013 comments) That's Brian in his yellow Revas with a friend in the blue Maria Sharapova Air Bacaras. I just purchased a pair of Wonder Gloves (Aluminum) . 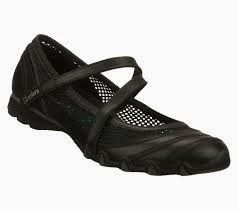 . . they are so comfortable, flexible and light on your feet . . . as a male I was looking for an attractive "barefoot style" shoe . . . hard to find in the men's section . . . Thank you Merrel! I wear them with my jeans on a regular basis . . . I have alreay received compliments from a few women and my wife. 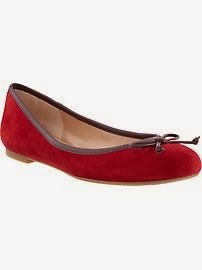 5) Banana Republic Ashley ballet flats - "very cute and better than home slippers, I own 2 pairs in black and cognac and I love them ($99. Cdn)" (Ivan, May 12, 2013) Just thought I would feature the red pair to entice you in 2014. I was a tad surprised that Ivan would like the bow but it proves that this too is an inappropriate preconceived notion of what men should like. It seems that if you are adding to a basic wardrobe of black and beige flats, red could be your next choice. 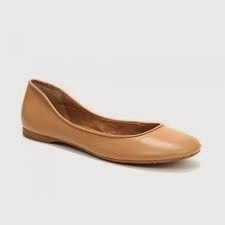 6) Michael Kors flats - "very comfortable and elegant flats". (Ivan, May 12, 2013) These are Michael Kors Halo flats which truly do look extremely elegant, perfect for a black tie affair. These look like a fabulous alternative to high heels for the women reading this. 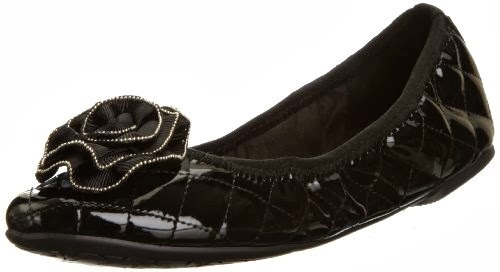 7) Lindsay Phillips Liz ballet flats - black patent quilted. (Ivan, May 12, 2013). Lindsay Phillips also has something they call "snap shoes", basically ballet flats with interchangeable decorative "shoe ornaments". 11) Jessica Simpson Leve ballet flats. (Anonymous, June 9, 2013) Another bow on a pair suggested by a male. I personally don't care for bows on shoes therefore I can only conclude that stereotyping ends now! 12) Lanvin ballet flats. Joelle Aidan was quite smitten by a muted Kelly green pair of Lanvins. I have recently broken the bank and purchased a pair of Lanvin ballet flats and the comfort level has set a new standard. Further, the Lanvin shoes (as simple as they are) are just beautiful to look at. (May 17, 2013) I don't know if these are exactly Joelle's Lanvins but from the description, I found many lovely pairs that were a pleasure to look at and finally chose this particular pair. 13) Sam Edelman Baxton (Ivan, May 12, 2013) Scroll down to the lower part of the Neiman Marcus Last Call page to see a variety of Sam Edelman Baxton ballet flats. And with that recommendation . . . different flats for different folks . . . Your experiences with ballet flats have an important place for this post's informative value and so I invite you to link to my blog (thanks Brian & Brenn and others I don't know about), add your comments here and become a follower. 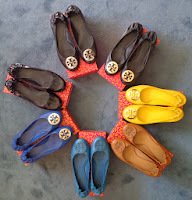 Ballet Flats Posts on this Blog . . .
What a great post to end off the year. I think of it as a gift to the people you wrote it for, us guys that wear ballet flats. 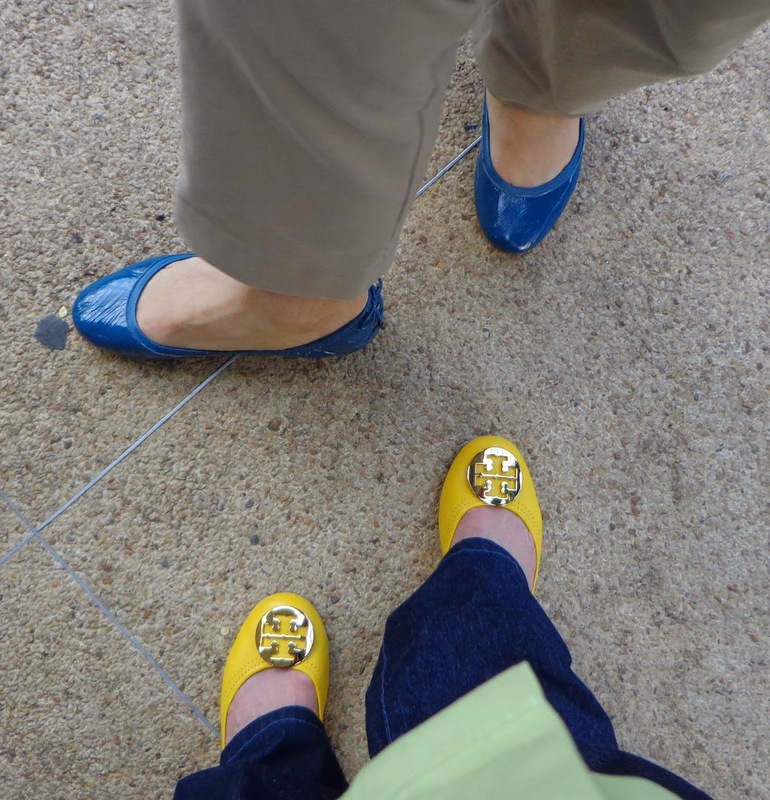 We may never know how many guys are interested or currently wear ballet flats but I'm glad many have found your blog and taken the time to leave you feedback on their favorite ballet flats. It's quite an impressive list. I'm sure there are lots more anonymous guys out there and hopefully they read your posts so they can gain the confidence to say," I'm a guy and I wear ballet flats." I personally cannot thank you enough for sharing my ballet flats collection and desires to wear them. It's been great to share this unique journey with someone like you. You are very welcome. It has been a pleasure. And also thank-you since I am speculating here but I know I would not have received near the comments and responses to other more mundane topics! Great end of year wrap-up Joy! I hope 2014 bring many new male ballet flat wearers. Nice to have you back and you must know how much I appreciate your comments. Thanks. Wonderful article, thanks a lot to take in count my suggestions, for sure I will get a pair of TB reva or eddie or both hope the Revas will fit me, thanks Brian for the wonderful pics of these TB models. otherwise I don't have any problem wearing bow ballet flats because I do ballet so for me it's very common to see my feet wearing bow flats, and I like how cute they look with jeans and capris. By thw way I got and other BR Ashley in militar green and the look great with beige or light green khakis. Great article and with the pics it' s easier to get an idea how this shoes look and easier to find them at the online stores, Thanks again and Happy New Year 2014 for you and al the folks who love to wear flats. You are most welcome and thanks for keeping me in the loop. As before, with info from the comments, there's always the possibility of a follow up post! Fantastic idea to provide some sample ballet offerings across all price ranges. I love all the diverse colors and shapes. Thanks for including my Maria Sharapova by Cole Haan Air Bacara's and the Merrell Wonder Glove. I continue to wear both pairs on a regular basis. I was just watching the movie Silver Linings Playbook and noticed at the end of the movie Jennifer Lawrence is wearing a pair of black metallic Maria Sharapova ballet flats like mine...obviously, she has good taste...LOL. I think your ballet flats favorite should become an annual list...Thanks again!! You are welcome! Good idea for an annual list. Keep returning with your newest favourites and I will keep my list updated to provide 14 Options in 2014. I can hardly wait. Hi! How to spot fake tory burch reva flats?? Post please!! Love your blog. It has been along, cold winter in Western Canada...not conducive to wearing ballet flats outdoors...thankfully, my wife and I had an opportunity to go to Los Cabos two weeks ago...I wore my Gap ballet flats couple of days...I'm heading to West Edmonton (large indoor) mall next week...I plan to check out the all shoe stores for the new ballet flats collections that they are being offered...Like Ivan commented Winners is a good store to find good quality ballet flats at reasonable prices...that's were I acquired my Maria Sharapova Cole Haan Air Bacara ballet flats (discussed above) for $70.00...another great place to shop for ballet flats is Value Village. It's Frigid on the Prairies!